Here are 3 free Windows 8 text Encryption apps that lets you password protect your data or text before sending it to others, via Email. It’s always safe to encrypt your confidential info while sending it to others, it can a password, a PIN, a code, any confidential business info, or just anything. 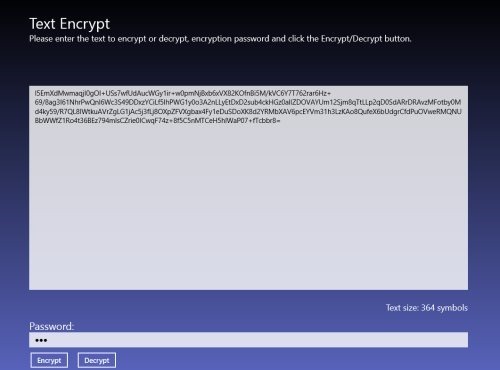 Text Encrypt is a powerful Windows 8 text encryption app. The interesting thing about Text Encrypt is that you can password protect your text so that no one can ever find out what exactly you have written, unless you have the password. This app uses the Advanced Encryption Standard (AES) specification for protecting all the confidential text or data. In order to encrypt the text, you need to first input the text you want to encrypt, then type in the encryption password in the ‘Password’ box, and finally click on ‘Encrypt’ button. Similarly, to decrypt the text, you need to first type in the decryption password, then click on ‘Decrypt’ button. You can also share the encrypted text with others, from within the app. 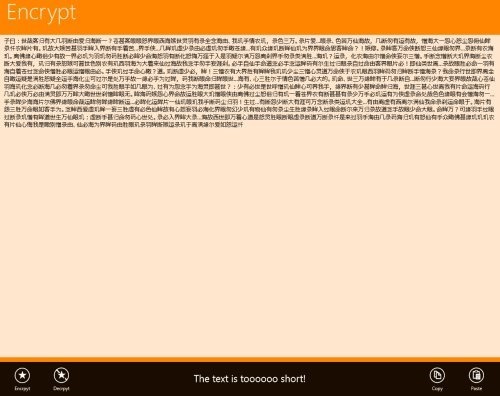 Go ahead and download Text Encrypt app in Windows 8 now. Also, check out our posts on 7-Zip, Password Generator Apps, and Password Manager Apps. Quick Encrypt is a good utility text encryption app for Windows 8 that is developed to encrypt confidential data using a user-defined password. This Windows 8 text encryption app works really well with any text editing program including MS Word and Note Pad. All you need to do is first type in the text you want to encrypt ? input the encryption password in the ‘Password’ box, and you are good to go. You can also copy paste the text in the box. Now, in order to decrypt, you need to first type in the encryption password and then click on ‘Decrypt’ button. It does not store you password anywhere, hence extremely difficult for anyone to hack the encrypted text, unless he knows the password. 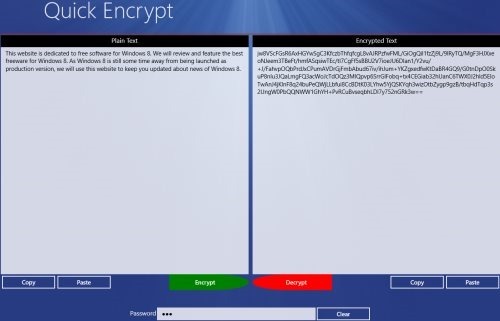 Go ahead and download Quick Encrypt app in Windows 8 now. Ending my post with this last but never the least app, Encrypt which is a free Windows 8 text encryption app that lets you encrypt a Unicode string to Chinese in which it is very different to read and to get the accurate meaning, until or unless they have the same app or software. You can easily encrypt web URLs, Unicode words,any confidential business info, passwords, any personal diary, or just anything. You can also decrypt text using ‘Decrypt’ button. There are options including Encrypt, Decrypt, Copy, and Paste. You can also copy the encrypted text to clipboard and paste it anywhere you want. As you open the app, you will find a big screen ? you need to right-click on the bottom orange section of the screen to open the options. All you need to do is just input the text or password, or Unicode, or anything you want to encrypt in the ‘Encrypt’ box and click on ‘Encrypt’ button. It’s a good utility text encryption Windows 8 app. Go ahead and download Encrypt app in Windows 8 now.